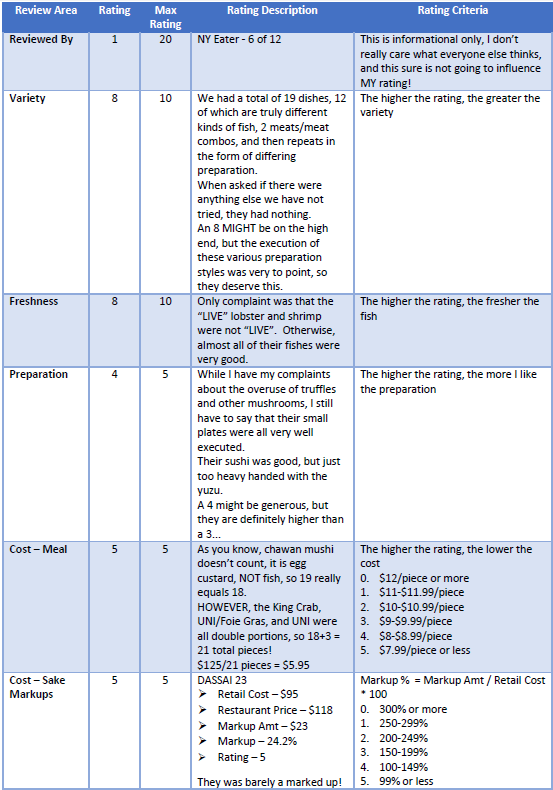 Before we start, I have to just come right out and say it, the food was great, the cost was exceptionally affordable, but the experience was just terrible. That said, let’s talk about our visit. If you’ve been reading my posts, you should know that my man and I are primarily downtown people. Boyfriend considers and actually refers to midtown as Canada, and uptown as the North Pole, or was it Antarctica? You get the point. 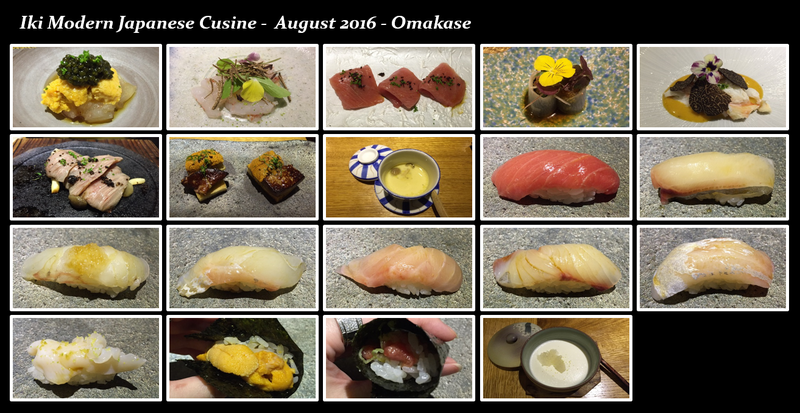 Our journey, the tour of NYC Best of the Best Omakases & Sushi-yas have taken him to Canada and the North Pole numerous times already, I don’t want to push my luck with the outer boroughs. Thankfully, my close girlfriend, Kitty Kat (she has a real name, but she allows me to call her this, so I do) is willing to travel with me! Kitty Kat is moving out of Hell’s Kitchen in New York City and into Great Neck, Long Island. While she’s renovating, she’s taking a temporary stay with her mother in Flushing. Since I have to visit my parents in Queens anyway, I figured 4 birds with one stone! Travel to Queens, visit my parents, hang with Kitty Kat, and check off the Flushing sushi-ya! I’m ALL about efficiency! No joke, I’m borderline OCD with the whole efficiency concept. I plan EVERYTHING in my life, even the simplest of things, like getting a refill on my water, and a pee break. No way am I getting off my behind unless I can accomplish multiple tasks. Yes, I’m a little cuckoo! By the way, my dear sweet Kitty Kat is single! 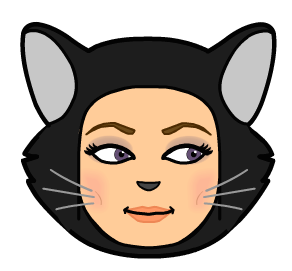 Sorry, I don’t like doing photos of people, a little invasive, but I love BITMOJIs. So here’s Kitty Kat! If you’re planning a visit, the first thing you should know is IKI is not actually inside the Hyatt. They advertised to be located at the Hyatt, but to get there, you have to first exit the Hyatt, and then walk down a half flight of external stairs before arriving at the restaurant. This was highly annoying only because it was pouring rain outside. To work in the restaurant industry, hygiene matters! The staff at Iki FAILED at things like having no dandruff, a clean/non-greasy head of hair, a clean outfit, and not having atrocious breath. The one and only waitress for the sushi bar (that seats 12) should know her dishes. You have to repeat it 12 times, how can you not know it? 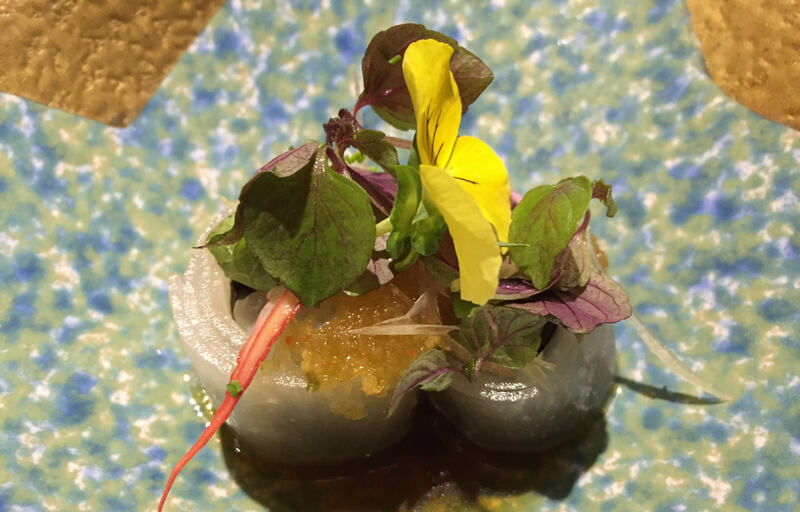 The Omakase at IKI serves a fixed set of small plates that is served by the waitress before going to the sushi round, served by the chef. That one waitress should know her plates. Screaming across the room should not be tolerated, especially not by the staff! Random teens that did not have a seat at the sushi bar but hanging around, standing by sushi bar patron friends sipping their bubble tea, and taking an occasional bite. Thanks for reading through that. Though the overall experience was not great, the food and the value is pretty insane, in a good way. ISE EBI SASHIMI with HOKKAIDO UNI and RUSSIAN CAVIAR – This delectable combination was dressed with a small bit of ponzu and topped with chives. 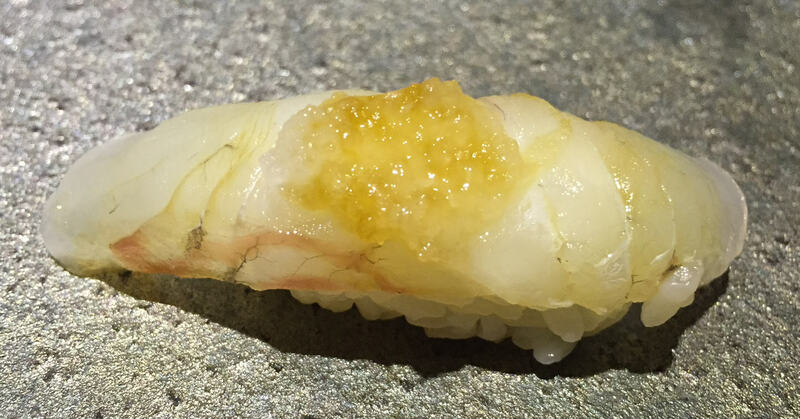 The ISE EBI (lobster) was not “live” lobster, the kind that you kill on the spot at the time of serving. You can tell by the crunch. Despite that, all three fish were very fresh, very good, and together, this was probably the best dish of the night. 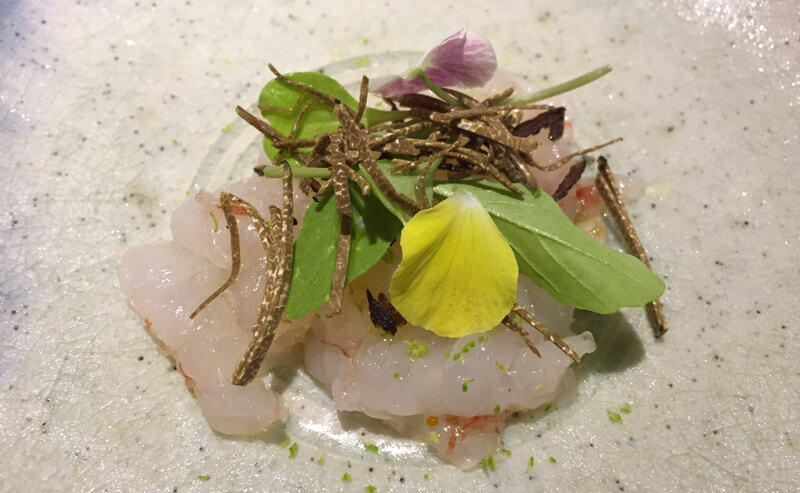 BOTAN EBI with shaved SUMMER BLACK TRUFFLE – Sounds good, doesn’t it? It was. Summer truffles are in general, the milder of the truffles, so it did not overwhelm the super light BOTAN EBI. Like the lobster, the BOTAN EBI was not live, but overall very good dish. 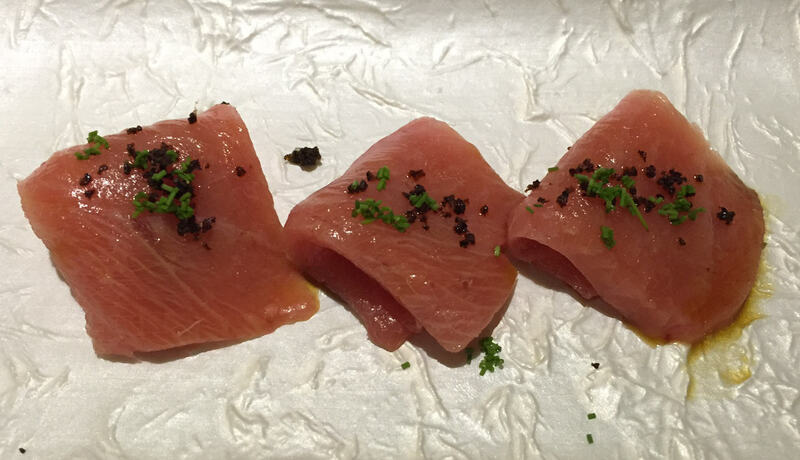 CHUTORO with Seaweed salt and chives – I’m a sea salt collector, yet this is my first time having seaweed salt, and I was very happy. It complimented the TORO very well. The CHUTORO, I had mixed feelings on. The TORO left a tinge of something that I can’t describe. It’s the same tinge of lower quality TOROs, and I really need to find the words to describe it. The second piece of TORO had a big vein in it, yielding it super chewy. 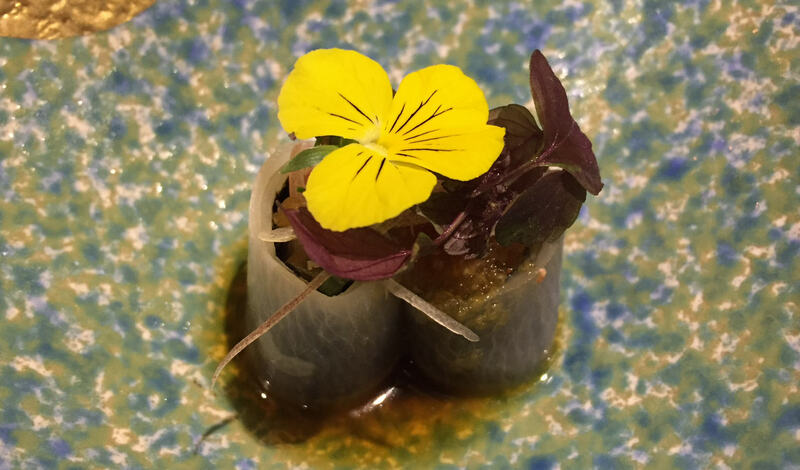 EBI and TAI wrapped in DAIKON RADISH topped with seasonal greens and ginger – This was a very refreshing dish, almost palate cleansing refreshing. I loved it. See the two photos though? The first is mine, the second is Kitty Kat’s. The left piece on my dish had too much DAIKON wrapping, which completely took over the plate. I had to cut some of it off. 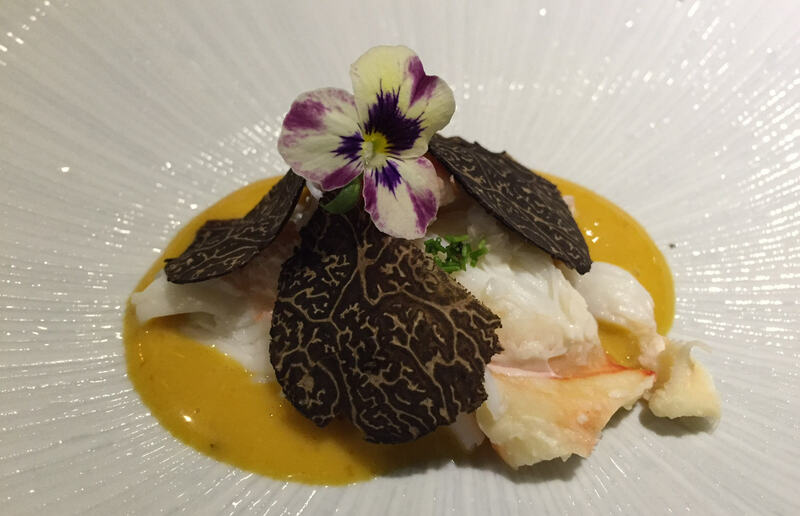 KING CRAB with UNI butter topped with SUMMER TRUFFLE – Another beautiful dish. This was my second favorite dish of the night. The crab was as fresh as could be. We saw them take it out of the water. While the truffle added almost nothing, the UNI butter sauce was marvelous, perfect compliment. 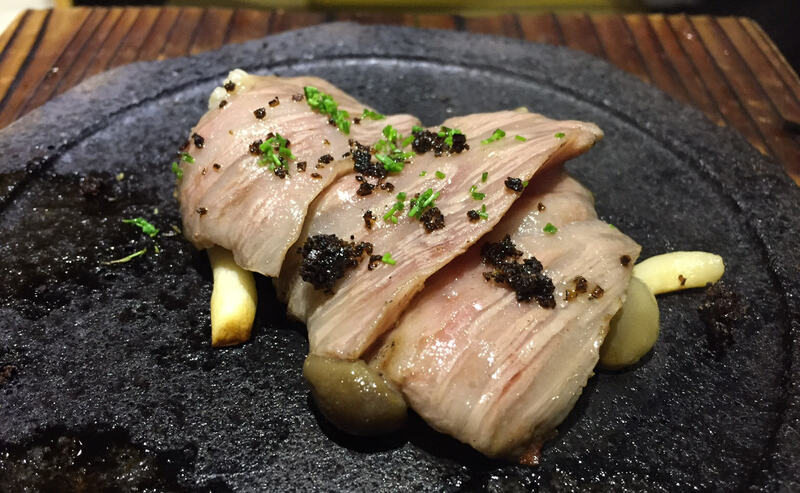 A5 WAYGU STEAK with SUMMER TRUFFLEs over BUNASHIMEJI mushrooms – Beautiful but 100% disappointing dish. The steak was not good. As a steak lover (not connoisseur, just lover and admirer), I really appreciate a good piece of meat, and of course a good piece of WAYGU. 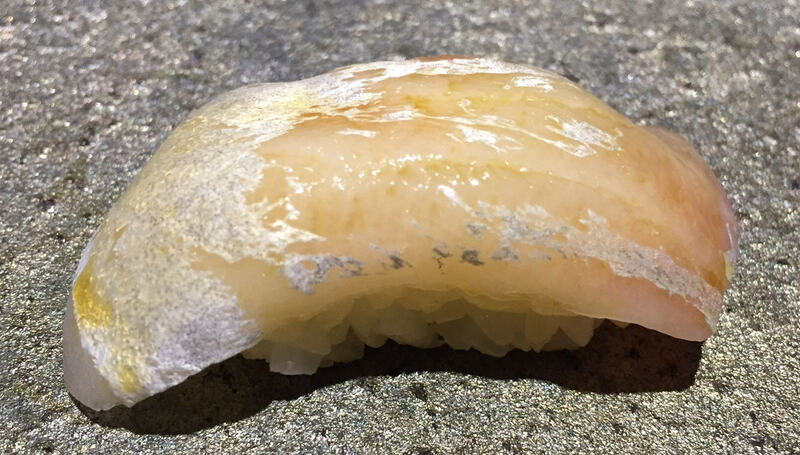 Really fantastic WAYGU can be served completely rare as sashimi. If this was a sashimi dish, I wouldn’t go near it with a 10 foot pole. I love my steak rare, so having it served on a hot plate was just an annoyance for me. The bunashimeji was really bland, almost completely flavorless. 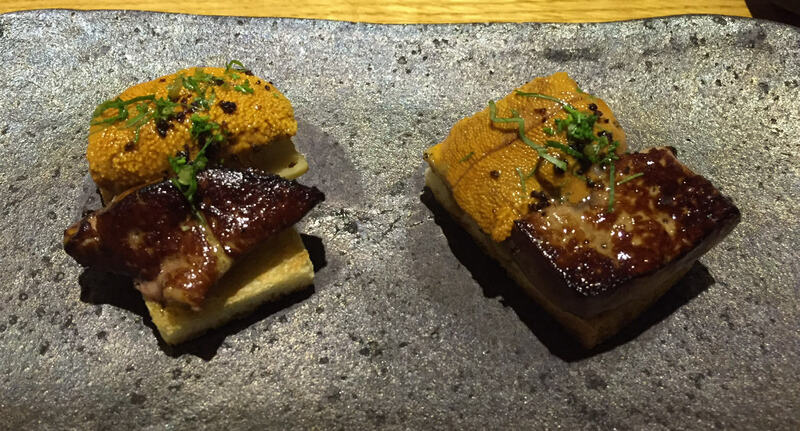 UNI with FOIE GRAS over KING OYSTER mushroom and toast – My third most favorite dish. We were instructed to consume this whole, in one bite, but that was difficult. One, I don’t like to do that, I prefer to taste the different flavors and two, it’s too much! 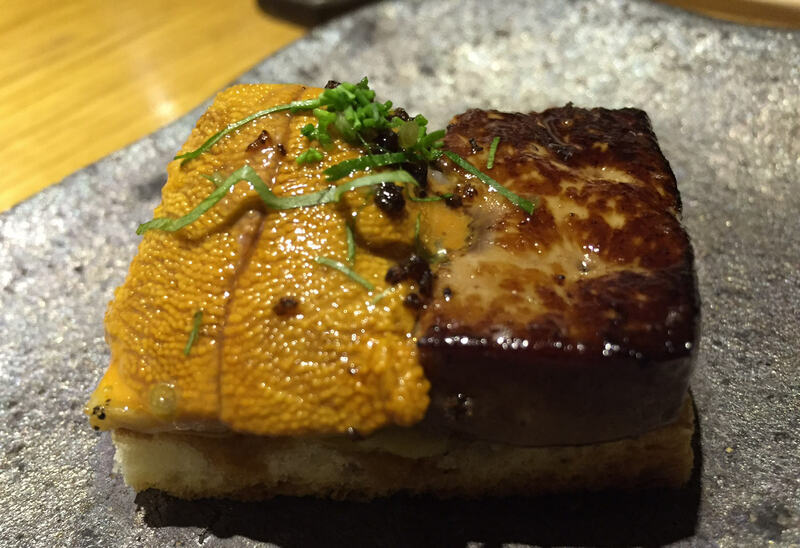 The FOIE GRAS was cooked perfectly rare, the UNI was super fresh, the mushroom was well flavored, and the toast was the perfect vehicle to transport all these goodies direct to me! Each person gets two of these delicious toasts. After tasting each individual portion, and being convinced on their quality, I would have preferred four half size portions, so I can consume it the way it was meant! Fantastic! 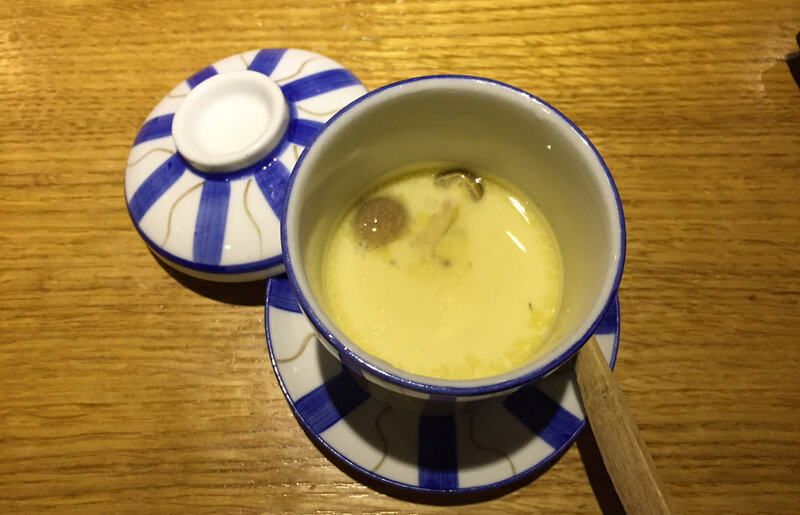 CHAWAN MUSHI – It’s egg custard. It’s good, but nothing mind blowing. More mushrooms. This place loves their mushrooms! Truffles, more truffles, BUNASHIMEJI, more truffles, King Oyster, back to BUNASHIMEJI. Yea, they love mushrooms! I wished they dressed it up just a little bit though. In the past I’ve been served chawan mushi with oyster, crab, EBI, UNI. I like it most with UNI. I love steamed egg custard, but I make a mean one at home, so I wasn’t going to waste my stomach space. I had probably a quarter of this, and then threw in the white flag. 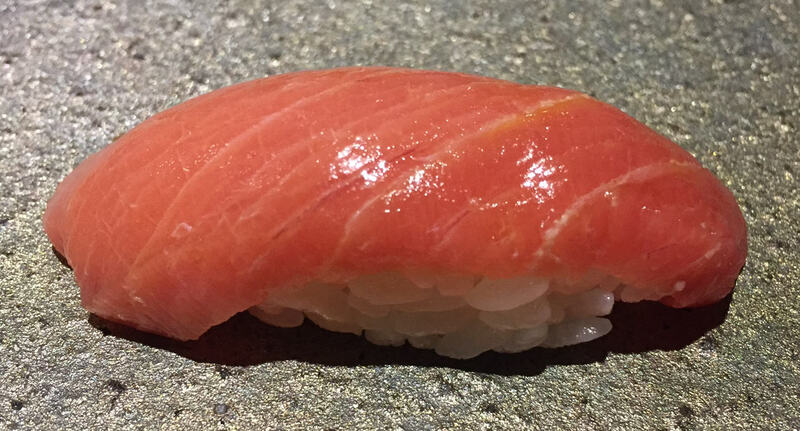 CHUTORO – This was very good, much better than what was served in the small plates. There was no funky lasting tinge, and not at all veiny. Just buttery goodness! 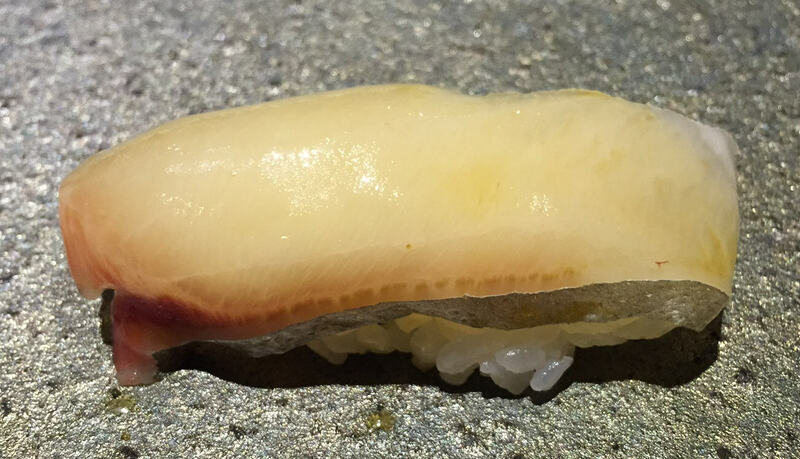 Shima aji – Wow is this cut thin or what? 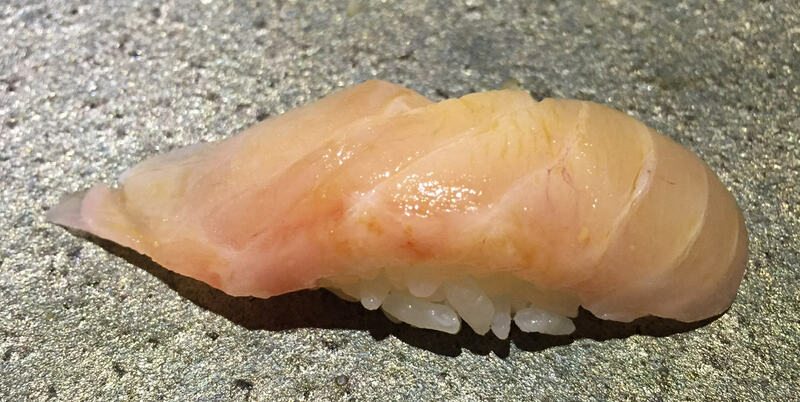 It’s prime SHIMA AJI season, and this was good, but you expect it to be. I wish I had a little more of it though! SUMMER FLOUNDER with MOMIJI OROSHI – Flounders are the milder (or in not so nice words, blander) of the whitefishes. The MOMIJI OROSHI (Grated Daikon Radish marinated with red chili pepper) adds a little bit to it, but overall still a bland fish. 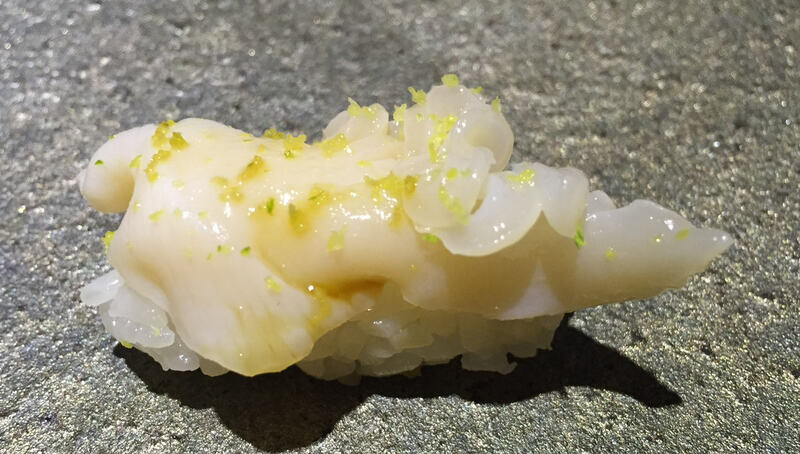 MADAI – The best sushi piece of the night! MADAI is one of my favorite whitefishes. This one did not disappoint! Very good! 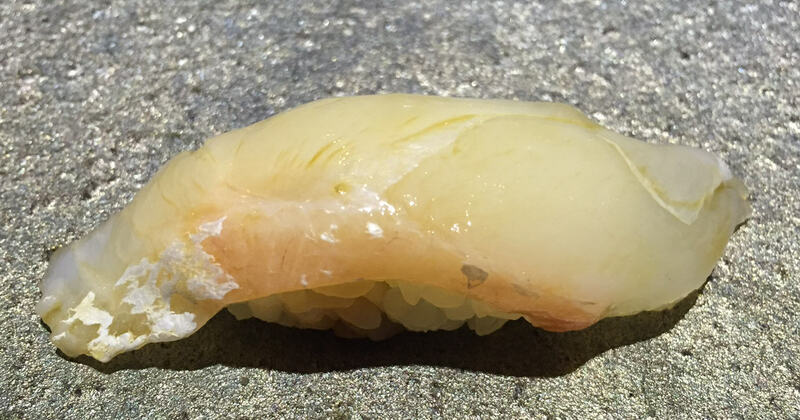 KINMEDAI – Another of my top 3 favorites in the white fish world. 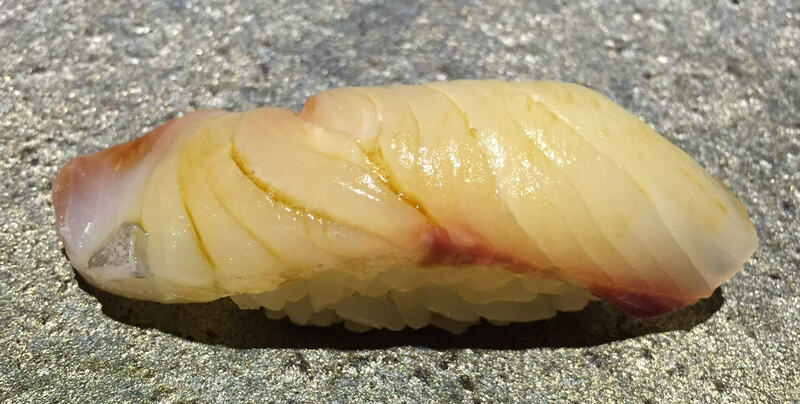 Two issues with this one though, 1 – quality of the fish – this one simply did not melt, and it should, 2 – Chef did not leave me any of the skin, and did not ABURI (torch) the skin. It was still good, but just not as great as it could have been. HIRAMASA – I’m not a huge fan of HIRAMASAs. It’s much lower on the yellowtail totem pole for me. HIRAMASAs are typically a fishier fish, this one fit the mold. It was ok, just not for my favorite. MEDITERRANEAN DORADO – Not a Japanese fish, but it’s very similar to the MADAI, a very light and tasty whitefish. This one was very fresh, very good, just wish it was served with some citrus. MIRUGAI – Very timely toss in, of a very yummy clam! Without it, I would have complained that there was not enough mollusks. 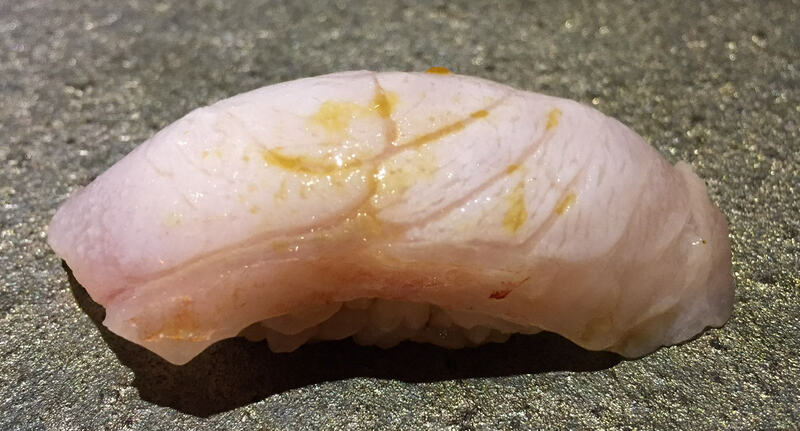 This was a very fresh piece of fish, it did not need all that YUZU zest. That was an overkill. Overpowering the fish. I could have used a tiny bit more salt though. 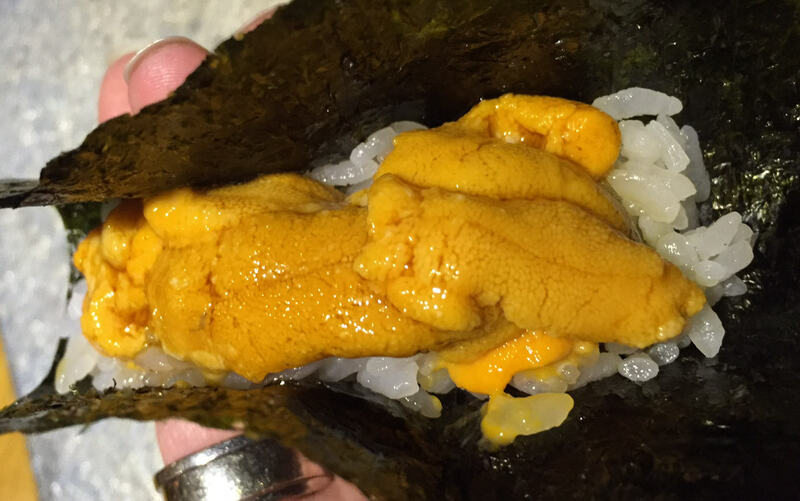 HOKKAIDO UNI – The UNI was fantastic, super fresh, super delicious. This photo does not do the portion size justice, it was a HEAPING amount of really fantastic UNI. HEAPING! My one and only complaint is the seaweed. I love UNI served in seaweed, but it needs to be crisp seaweed, warm and toasted would be even better, but just crispy is good enough. This seaweed was downright soggy, gross. 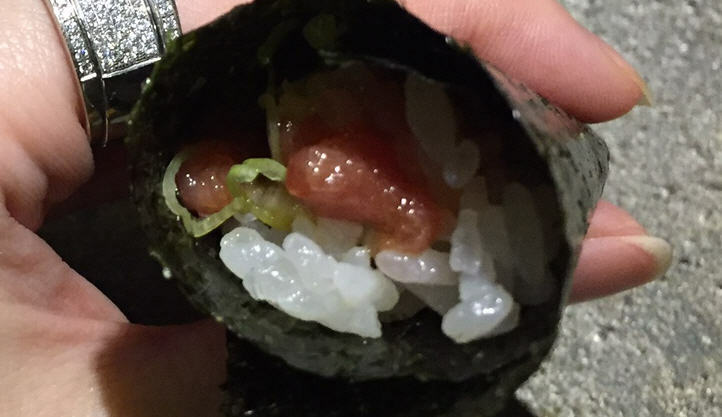 TORO hand roll – The TORO was good, same quality as the CHUTORO sushi, the seaweed was again, soggy & gross. What a waste! KINMEDAI – I’m a true lover of KINMEDAI. The last one here had potential, but was just off. I had to give it another chance. Requested the fish WITH skin ON, and heavily ABURIed (torched) on JUST the skin, and not the meat. This resulted in another KINMEDAI with no skin, and the meat ABURIed. 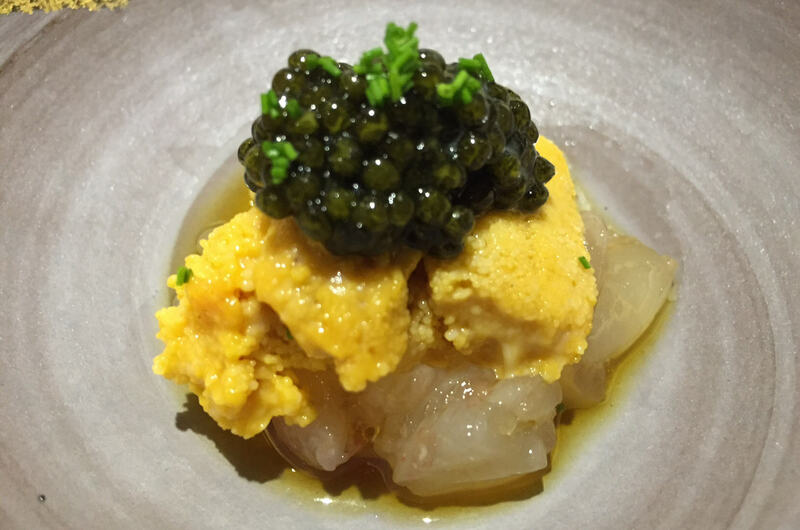 HOKKAIDO UNI – I briefly contemplated the repeat of either the MADAI or the DORADO, as those were my two favorite pieces of the night, HOWEVER my greedy self took over. 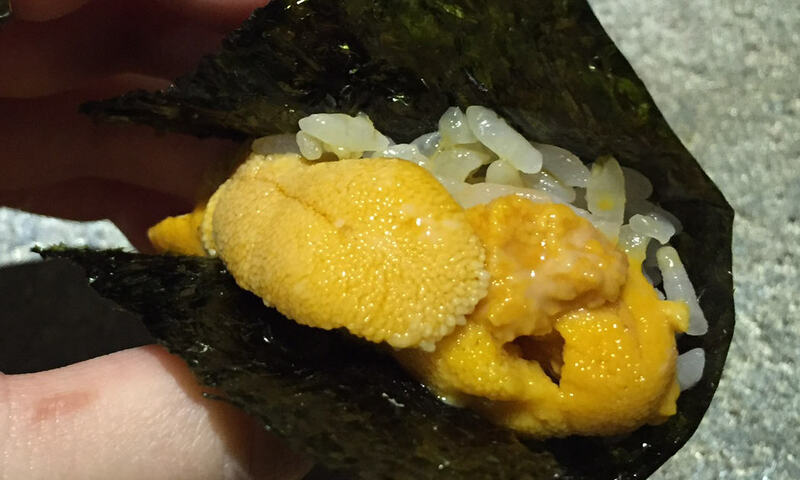 Despite the yuck seaweed, the UNI was super fresh, and was like a double portion, so UNI It up! As you can see, this second round is closer to a triple portion. SCORE! 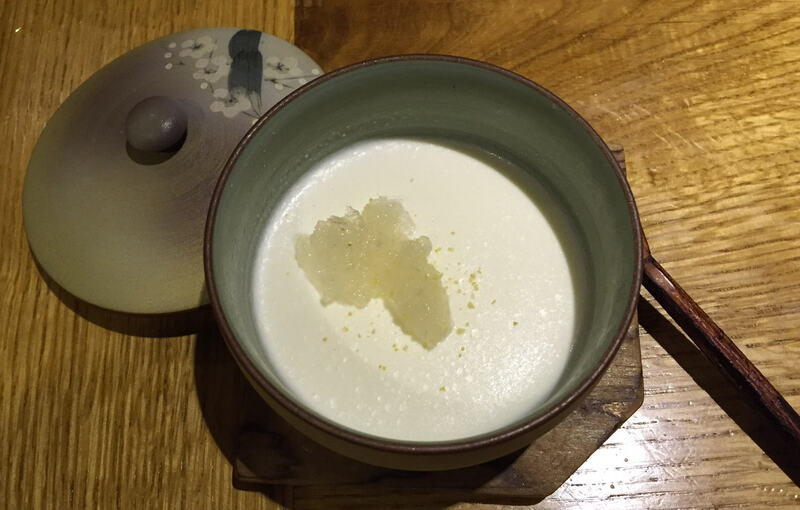 COCONUT PUDDING with BIRD’S NEST – The coconut pudding we really good, and the birds nest was like all birds nests, flavorless. Do you know what Birds Nests are? Squirmish people stop reading! Birds Nests are essentially NESTS made by swallows on the tops of the inside of caves during breeding season for their young. Once their young leaves the nests, the empty nests are harvested, processed, and sold. The Chinese believe these Birds Nests are a cure all of numerous ailments, and a great means to improve on skin/complexion. I’m no spring chicken, but I have REALLY fantastic skin. My mother swears that my skin is only so great because of all the birds nests she fed me all these years. It’s a fairly flavorless ingredient, but the Chinese swears by it, making it an extremely expensive ingredient. Who knows! I started this post saying that the food was great, the cost was exceptionally affordable, but the experience was just terrible. Now that I wrote the whole post, I might have been a little harsh. It wasn’t terrible. The space is beautiful, the food is really good, and they tried. Their staff just need a whole LOT of finessing. And as much as I complained about it, their lack of traditional Japanese etiquette did at one point, work in my favor. I mean, where else would I dare give the chef instructions on how to make my KINMEDAI? Long story short, the positives definitely outweigh the negatives, which I have faith will improve over time. I will definitely be back. IKI gets a very impressive 31 out of 35 overall score.